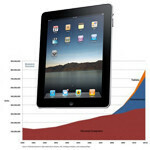 IDC has the numbers in for worldwide tablet sales in Q4 2011, and Apple continues to lead the pack, with the iPad 2 accounting for more than half of all tablets shipped. Android managed to climb to 44.6% of the tablet market, but most of that gain stemmed from the Kindle Fire, which runs a forked version of Android. Amazon shipped 4.7 million Kindle Fires, which was worth 16.7% of the market. Samsung is in a distant third place with 5.8% market share. Apple is seeing tremendous growth in iPad sales, and there’s little doubt that the new iPad with its Retina Display and LTE radio will see that continue. Still, the tablet market is growing more rapidly than iPad sales, and Apple’s market share of 54.7% was a significant drop from the 61.6% of the tablet market Apple commanded in Q3. Amazon is reported to be selling the Kindle Fire at a slight loss, so Apple is claiming the lion’s share of the profits from tablet sales, but in some ways these numbers appear eerily similar to the growth of Android phone sales in the beginning of 2010. If Google manages to market a $199 Galaxy Nexus tablet next quarter, and if NVIDIA is right that we’ll see plenty of quad-core tablets in the sub-$300 price range by mid-year, we could be looking at a very similar market story, albeit with slightly different players. In that scenario, Apple would stay head and shoulders above the competition in terms of profitability, but the volume of sales of Android-powered tablets could pass the 50% mark in the second half of 2012. Perhaps Apple’s rumored 7.85" iPad is intended to combat that problem. We expect that Q1 of 2012 will see a bit of an Apple resurgence from new iPad sales, so all eyes will have to be on the second half of the year. We’ll be sure to let you know when we find out! (aka regular android tabs aren't selling) The only thing the Android tabs need is good, unified marketing. Google should be advertising their tablets across all their sites. With all the advertising power that google has, they aren't using it too well with their tablets. Well...though kindle is android based but I think it deserve separate category for market share. Yeah but at the core it has a specific modified version. for instance 2.3 and who knows it may receive a future update to ICS. It is still android with a overlay. no, it doesnt really help other than numbers. people say they have a kindle tablet, not an android. on a positive note, apple is about to lose majority market share. it didnt even take android 2 years to take it. Honeycomb is barely a year old. LMAO! remixfa please be gentle! You don't need to break the poor little iFans hearts. The tablet market was their last foothold & claim to fame. Remember when we were saying it was only a matter of time until Android just takes the tablet market away from Apple? First it was the iPhone, the world’s greatest & best, it fell to Android, then the iPad & look at it now, it's going to fall to Android faster than the iPhone did. lol Classic example how history REPEATS itself! The Android steam roller is just too big! The signs are very much like the rise of the android smartphones a few years ago,if the nexus tab does arrive with high specs and expected low price then we Will indeed see a big shift in power in the tablet market. asus Will be releasing the 1080p transformer and Ive a feeling Samsung may have a powerhouse quad core high resolution tab yet to be unveiled. i can't wait till i buy the sub 300 dollar tablet if and when it comes out i also hope it has a full hd display that would be awesome. It's sad that OEM's can only sell tablets running android if they sell the tablet at a loss. More proof that only cheap crapdroids "sell". no, its proof that not everyone feels they should make someone else rich for an item that does less than a smartphone. its called "smart shopping". The only thing the ipad has on the Fire is a camera.. wooptiedoo. Tablets do not need cameras. My phone is always with me and is easier to snap a photo. Companies should save money by not putting them into the tabs. This would be interesting to see how things go in the next few years. I want to make a few points here, majority of buyers out there aren't that into spec and performance. They don't even know what's high end and what's not. Come on guys, let's be realistic for a moment. Why iPad is selling so well? Because a lot of people have an iPhone to begin with, so it's easier to carry the apps over and that's what they know and feel comfortable using. Furthermore, people buy their kids an iPad because it's famous and their kids want it because their friends have it. There are a lot of elements to take into account why iPad is selling well. Not saying the iPad isn't a great device (I am am android fan but still think that iPad is sweet), it's just that most of consumers out there aren't that knowledgeable. People like us who are on site like Phone arena everyday to read the latest tech news are the minority in the common marketplace. It is hard for us to influence the market share of tablets. is it sad?